During the weekly non-violent protest in Kufur Qaddoum village, in the northern part of the West Bank, 13 year old Khalid Murad Ishteiwi was hit by a rubber coated steel bullet, which lodged in his thigh. He was rushed to the Rafidiya Hospital, where he is in stable condition. The attack on the weekly protests follows a similar attack last week in which Israeli forces wounded a three-month old baby. The baby was reportedly among several Palestinians injured by Israeli forces suppressing the weekly peaceful anti-settlement procession, on Friday September 28th, 2018. And the previous month, an international supporter from Norway was shot while at a protest in Kufur Qaddoum. 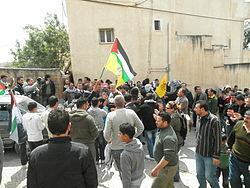 Morad Eshteiwi, the Coordinator of the Popular Committee Against the Wall and Settlements in Kufur Qaddoum, told reporters from the Ma’an News Agency that Israeli forces raided the village before Friday prayers, to suppress the weekly march that takes place every Friday after noon prayers, for the past ten years. In addition to the wounding of 13-year old Khalid, another youth was wounded in the hand by a rubber-coated steel bullet. During the attack, Israeli forces invaded Palestinian homes in Kufur Qaddoum and occupied rooftops. There, they fired tear gas grenades and rubber-coated steel bullets into the village. Tear gas entered homes and yards, causing many residents to suffer from tear gas inhalation. According to the Ma’an News Agency, the speaker for the Omar Bin al-Khattab Mosque in Kufur Qaddoum, Sheikh Abed al-Razzaq Amer, was abducted by Israeli forces along with his son Usayd. The two were on their way to Friday prayers when their vehicle was seized and they were abducted. The Israeli soldiers then used their vehicle to hide behind when Palestinian youth threw stones at them. This caused some dents to the vehicle. 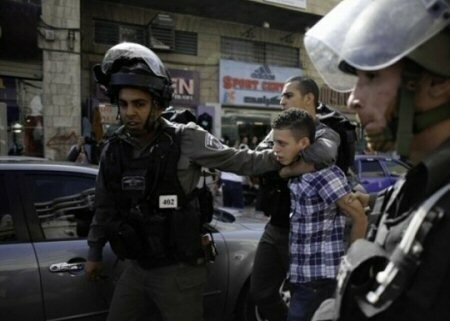 The Prisoners and Ex-Prisoners’ Affairs Committee said that Israel detained 35 Palestinian children during September, and imposed on them fines exceeding $12,600. The committee stressed, according to Ma’an, that the detention of minors is a violation of international law and the convention on children. Defense Minister Avigdor Lieberman stated that his forces are ready to conduct a military operation against Gaza strip and bragged in killing Palestinian protesters at the border fence, posing a direct threat to Hamas. “We got through the High Holy Days just as we had planned, without a war erupting and while exacting a heavy price from the rioters on the Gaza border,” Lieberman wrote on his Twitter account, Friday. “But the holidays are now behind us, and I tell the heads of Hamas: ‘Take that into account,” he added. According to Prime Minister Benjamin Netanyahu, Abbas “has interfered in all UN attempts to ease the plight in Gaza.” “If Hamas thinks that as a result of this plight it can attack Israel – it will be making a very major mistake. Our response will be harsh, very harsh,” Netanyahu warned. “First of all, I never went to war—war came to me. And my question, in all truth, is the opposite. Why should I trust them? They left Gaza in 2005, and they simply reshaped the occupation. They were inside, now they block borders” he added. “There is no future without Hamas. There is no possible deal whatsoever, because we are part and parcel of this society, even if we lose the next elections. My responsibility is to work with whoever can help us to end this deadly and unjust siege,” Sinwar continued.